Now, in my opinion, while broccoli has a slightly more specific flavor, cauliflower is much more neutral, tending to take up whatever it is mixed with, making it a perfect pairing for a casserole with broccoli. That very neutral flavor is what makes cauliflower so popular with the low carb crowd, who use it for things like a substitute for pizza crust and mashed potatoes. I once tried to pull that faux mashed potato thing off with The Cajun. While I think it's tasty, and some people enthusiastically proclaim "you can't tell the difference," my husband, and I, would certainly disagree. The method I most use when I eat broccoli is to steam it and toss with some olive oil, salt and pepper and red pepper flakes. Simple and delicious, but with the holidays upon us, using it in an indulgent, creamy, cheesy and buttery casserole is perfect for the holiday table and for those of us who love these wonderful veggies. A simple butter roux-based white sauce made with The Trinity, with a little cheese is the base, then topped off with those buttery crackers we all love so much... and a little more cheese. Since the tastes of both of these vegetables can be rather neutral, be sure and taste and adjust the seasonings before it hits the oven. Preheat oven to 350 degrees F. Butter or spray a 1-1/2 quart baking dish; set aside. Bring a pot of water to a rolling boil and add 1-1/2 teaspoons salt and the broccoli and cauliflower florets, return to a boil and boil for 2 minutes. Carefully drain and transfer immediately to a large bowl filled with ice water to stop cooking; drain again and set aside. Melt 3 tablespoons of the butter in a large skillet, add onion, bell pepper and celery and cook until tender about 3 minutes; add garlic and cook another minute. Add another tablespoon of butter and stir in the flour until fully blended; let cook, stirring constantly for 2 minutes, then begin adding the milk a little at a time. Add seasonings. Remove from heat and stir in 1/2 cup of the cheese until blended; stir in remaining tablespoon butter. Taste and adjust seasonings as needed. Add lemon juice to broccoli and cauliflower and gently toss; transfer to prepared baking dish and cover evenly with cheese sauce. 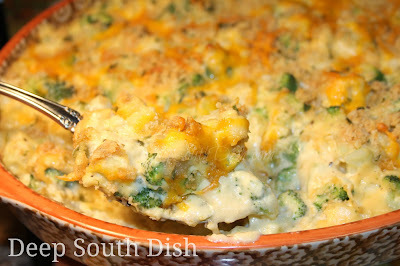 Mix topping ingredients and sprinkle on top of casserole; scatter remaining shredded cheese on top. Bake, uncovered, at 350 degrees for about 25 to 30 minutes, or until bubbly and top is lightly browned and vegetables are tender and casserole heated through. Cook's Notes: May substitute a pound each of frozen, thawed, broccoli and cauliflower florets; may also use all broccoli. No need to blanch frozen vegetables. May also use chicken broth or a combination of broth and milk. The sauce will thicken with baking, so if it's too thick, loosen with additional milk, adding 1 tablespoon at a time to desired consistency, before pouring over the vegetables. Sauce should be fairly loose, but not runny. If using salted butter, take care with added salt. As always, taste, add a little, taste again and adjust. Hi - Dumb question - if you use frozen veggies (which is my habit) do you cook those according to the instructions or just put them into the casserole once they've defrosted? Thanks! No dumb questions here Amy! When you use frozen veggies they are already blanched before freezing, so just let them thaw! I adore both of these vegetables, especially cauliflower, which is such an underutilized vegetable in restaurants. Why not roast it and serve it to diners? It's absolutely delicious. I'm thinking it's because it's white and not very colorful on the plate, it gets the axe in favor of the more versatile or favored potato, but if I ever saw a cauliflower dish on a menu, I'd order it! Especially roasted until crispy. You know, you are probably right Kate! The only time I see it at a restaurant is when they serve it with the steamed veggie side. compare prices of heads of cauliflower and potatoes. ... imo this is why restaurants are not serving it. What if I wanted to add shrimp? How would I adjust the liquids? Hi Rochelle! Keeping in mind that I have not tried it, I don't think you'd have to make any adjustments in liquids. Just stir them in the white sauce. 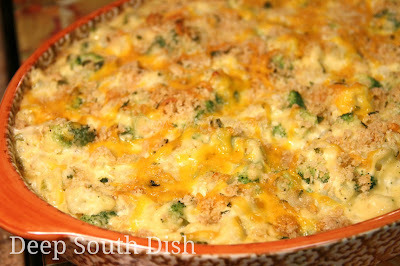 Can this casserole be made a day ahead and leave the topping off until ready to bake? I haven't made this ahead, but I see no reason why you couldn't!